Today, the daisy is still a symbol of affection – it represents innocence, purity and true love. As composite flowers, they are actually two flowers combined as one: a disc floret in the center and the outer petals (ray floret). Because they blend together as one, they symbolize true love. Daisies make beautiful arrangements on their own. 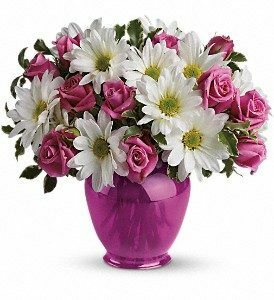 They also add delight, and are most often used, in mixed floral designs, ranging from roses and lilies to mums and more. While the beloved daisy may not be able to tell whether he or she loves you – one thing is certain – this timeless classic has a long been loved and brings a smile to all those who receive it.